We arrived in Accra without any problems (and without our luggage) and met up with the island goers at the incredible Alma House in Accra. This year, like last year, a group of students arrived in Ghana a few days before the rest of the group to live with village families on the island of Pediatorkope. It’s like camping, only with typhoid infested water, raw oysters and fish, malaria-bearing mosquitos, and extreme tropical heat. While it’s a great experience for them, I’m quite content with never, ever doing it. Six of the eight students on the trip went to the island this year (we actually have a relatively small group this year: 8 students, Aaron Miller (the faculty director), Dr. Rex Facer (a faculty member who’s coming later this week), and me). After their mission, they bought a (really fancy) house in Accra so they could maintain substantial connections with the region. 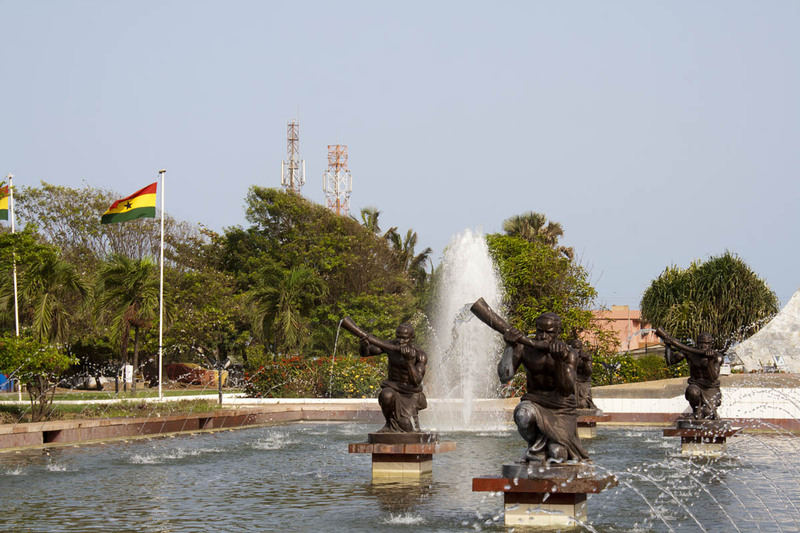 As Ghana has improved in its development and become more friendly to international investment, lots of the Gays business friends (and personal friends) decided that visiting Accra would actually be quite interesting. In order to accommodate these visitors (and make it so the Gays wouldn’t have to host them at their own home), the Gays bought a guest house near the Accra Temple that could (1) comfortably host American and foreign visitors, and (2) provide employment to Ghanaian and Nigerian returned missionaries. The Alma House totally lives up to the Gays’ vision. It’s the nicest place I’ve stayed in Ghana and has an incredibly homey feel to it. There are only a few bedrooms—our group of 10 (soon to be 11 when Dr. Facer arrives later this week) fills the guest house comfortably. There’s one big table for meals, a nice lounge area with leather furniture, relatively fast and reliable wi-fi, and incredibly high security. It’s in a walled compound with electrified barbed wire coiled around the top of the walls, and a few of the bedrooms have doors that have five deadbolts and are apparently filled with acid (I guess in case someone tries to take down the door with an ax or something…). Bob Gay was recently called to the 1st Quorum of the Seventy, so they probably won’t be back to Ghana too often in the coming years, but the Alma House remains and is an incredible place to stay. Because Dr. Facer isn’t here yet, I get a single bedroom all to myself (complete with acid-filled front door), which has an awesome bathroom and double king size bed. It’s huge! After lunch, we drove around to see some of the highlights of Accra. Unfortunately, the awesome Delta in-seat movie console kept me awake all night and I crashed with jet lag during the tour. This wouldn’t have been a problem ordinarily, but I sat up on the front row of the bus, right in front of the tour guide. Hooray for tour etiquette. I did manage to wake up at the two touristy places we visited. The first was the Kwame Nkrumah national memorial, built on the site of the old British polo grounds were Pres. 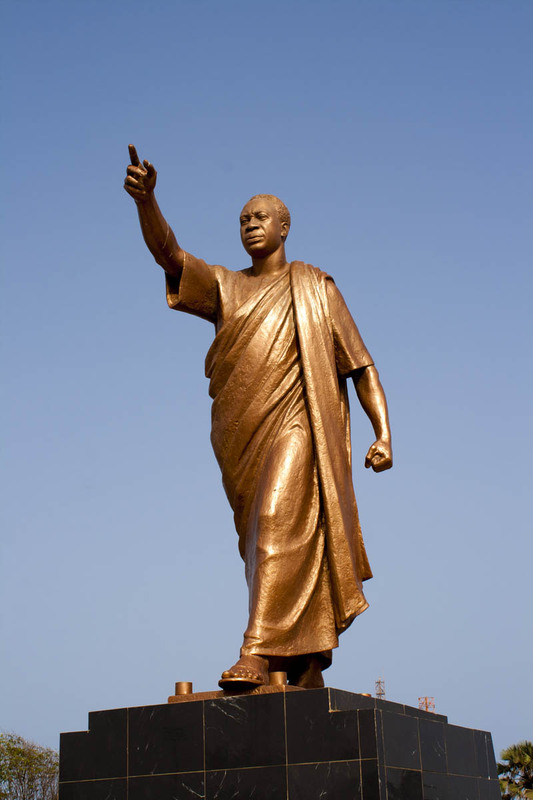 Dr. Nkrumah declared Ghanaian independence 55 years ago. 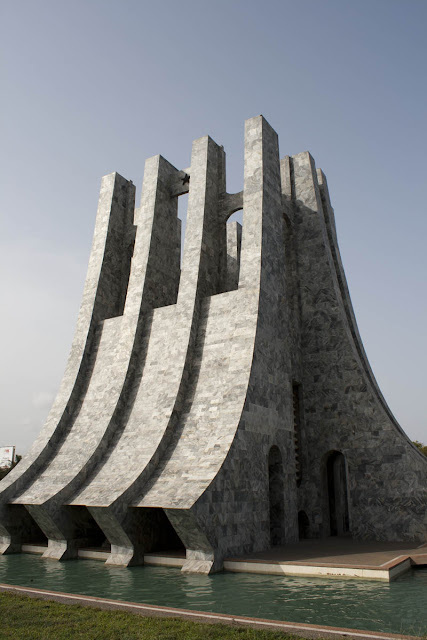 The main memorial was designed to look like the trunk of a tree and is apparently symbolic of Nkrumah’s vision of a sort of Pan-African United State of Africa type of entity. He set the foundation—it’s up to the rest of Africa’s leaders to build their branches on that trunk. Or something like that. After the memorial we drove down the street to one of the main Accra art markets where we were overwhelmed by hawkers trying to sell their touristy wares. I ended up playing (and losing) a game of mancala to one of the shopkeepers, who then sold me the game at a (supposed) big discount. Fun times. We headed back to the Alma House for dinner and a football match (Chelsea vs. Real Madrid), and then fortunately heard from the airport that our luggage had arrived. Delta had rerouted it from New York to Amsterdam to Accra on a KLM flight—all we had to do was go pick it up and pass through customs, a seemingly simple task. Lawrence, one of the Alma House employees, drove us out the the airport and waited in the parking lot while we ran in to pick everything up. We went into the back room and started a semi-absurd bureaucratic ritual to get our stuff. Ordinarily clearing customs is extremely simple—customs officers only look through the luggage of a few people on each flight, since there are normally hundreds of bags to potentially go through. However, with only three of us, with two bags each, the customs officials decided to look through every little thing in our suitcases. Highlight of their evening, I’m sure. We ran into problems with each of our second bags. One of the students on the trip is the executive director for Empower Playgrounds, and to save on shipping costs, he gave each of us a suitcase full of solar panels, battery chargers, tools, and food (since Delta still gives two free bags on flights to Africa). Once our customs lady saw that we had small solar panels, she decided that they were a taxable good (they’re not) and that we had to pay a hefty duty (we technically didn’t). Since everything in our extra bags was theoretically duty free, we fought her and made her call her supervisor, who happened to be busy. After 20 minutes of hanging out in the lost and found room, he final called and told her to just let us go—it wasn’t worth the effort to try to eke out customs duties on exempt items. We finally signed a bunch of different papers and notebooks and left with our stuff. Even with all the flight rerouting and luggage loss and customs battles, I was able to get all of my luggage in Ghana on the first night, which is pretty incredible. Hopefully it’s a sign that the rest of this trip will go as well. Last time I knew the Nkrumah statue had no head. Nice to see he's located it again. Oh, the headless statue is still there. The gold one is a fancy updated version of the one that was torn apart after Nkrumah was deposed.